Many great nations and peoples have measured the passage of time through myriad methods, too numerous for me to list or spend the time trawling Wikipedia for information. I imagine few – if any – have ever ticked off the passage of time by gaming conventions. 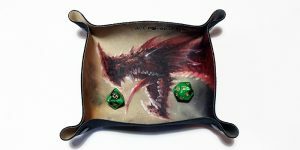 However, when you’re the wingman to a woman who has created a highly popular alternative to the common or garden dice bag, conventions become like the ominous ticking of a great clock. In retrospect, I’ve struggled to pin down the exact moment that All Rolled Up got entangled in Pelgrane Press’s highly successful Dracula Dossier Kickstarter. I have the feeling that it might have been somewhere in Milton Keynes at the thoroughly friendly twice-yearly event known as Concrete Cow. At Concrete Cow, in March 2014, All Rolled Up had been running for almost a year. We had sold hundreds of All Rolled Up dice bags and Fil had just about got into the swing of being her own boss; finding her way through the complexities of weekly quotas and taxes. Cat loved the product and I dare say we might have talked with her about doing something for one of Pelgrane Press’s games. UK Games Expo swung around at the end of May. 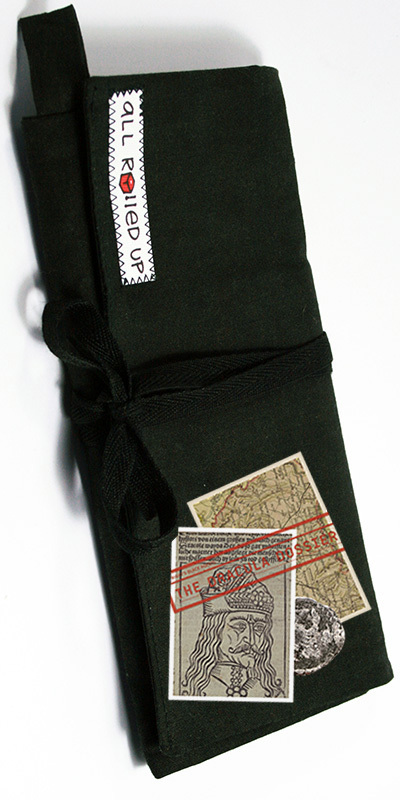 Expo that year felt a bit special as the All Rolled Up game roll was included in the event’s gaming awards as Best New Expansion or Accessory. There might have been some discussions at Expo, but I’m not sure. Something must have happened because when November rolled around we were talking fabrics. I’m rarely trusted with making decisions about the finer details of mix and match textiles. I remember Fil having swatches; she and Cat talked at some length toward the end of the event. I think the Kickstarter had already started, but Cat was happy with the colours and the proposal of two different All Rolled Up – and soon after a bunch of new pledge levels appeared. And in fairly short order, those pledge levels sold out. That took us by surprise. 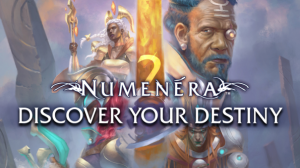 We kept a keen watch on the Kickstarter throughout. Each day we’d count up the number of people pledging for levels with an All Rolled Up included. When they eventually sold out, it started to dawn how much work would be involved – not least the sourcing of such a large volume of fabric. Fil had prototypes ready for Dragonmeet – so Cat, Simon Rogers, and Ken Hite could all have a look. I contributed the badge design for the outside – with a design idea based on the draft cover for Dracula Unredacted. After the thrill of seeing the Kickstarter end so well and the multitude of All Rolled Up claimed, the New Year meant we had to plan very carefully to hit our target dates. 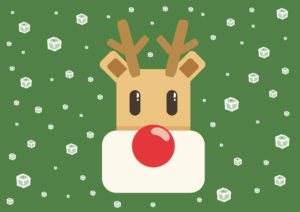 The business has a regular supply of online orders, as well as necessary stocking up for big events. And fabric takes time – often months – to come in from our suppliers. 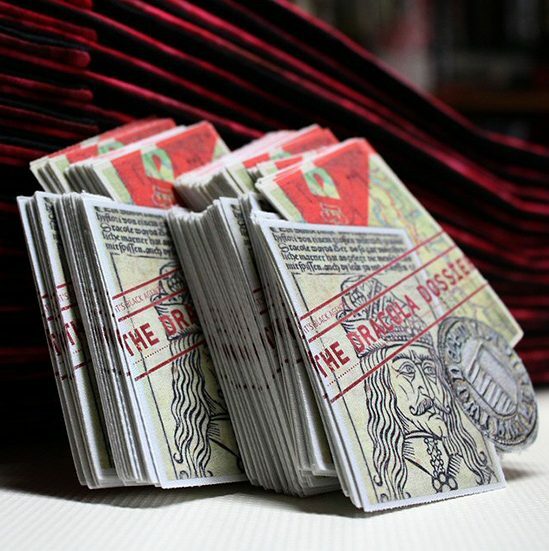 By early Spring and the next Concrete Cow, we’d firmed up the supplies and I had a dozen alternate designs for the Dracula Dossier badge that would go with it. 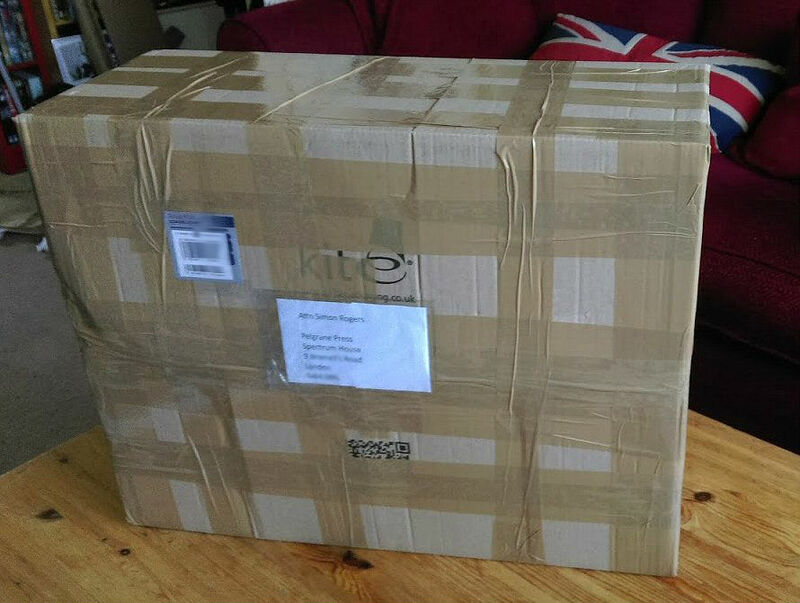 UK Games Expo in May absorbed all sewing efforts thereafter, so we didn’t get down to the nitty-gritty until summer. In the following three months, Fil set to cutting, sorting, organizing and sewing the component parts of the two designs – with my assistance and our youngest son, David. Bit by bit they came together and I spent time finalising the badge design and getting it printed up. The time wasn’t without challenges, for when you rely upon machines they invariably let you down just to remind you how much you depend on them. BackerKit made life interesting. As the pledge levels didn’t commit to anything more than an All Rolled Up, we had to wait until completion of the BackerKit entries to discover the balance of black and red. We had early calls that provided a rough ratio – black winning over red – but it was some time before we had finalised figures. In addition, we had to make extra, because when you run a Kickstarter you need to allow for those unexpected eventualities. We rooted through the garage and pulled out the biggest box. As it happens, with just enough padding, it holds all the All Rolled Up rather neatly. Once Fil completed the game rolls, I designed the labels for the packaging. Gareth Ryder-Hanrahan and I came up with the names – The Black Archive and The Red Room, respectively. It seemed appropriate to get one of the game designers involved! Then, secured in individual plastic bags, labelled and pressed, they travelled cross-country to Pelgrane Press in preparation for the final release. 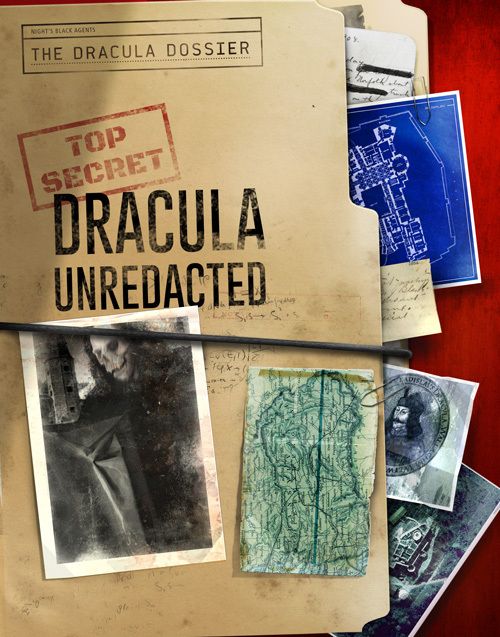 Since then, we’ve seen them scattered far and wide across the globe – most recently, during the mammoth 18-hour game of The Dracula Dossier at Longcon. 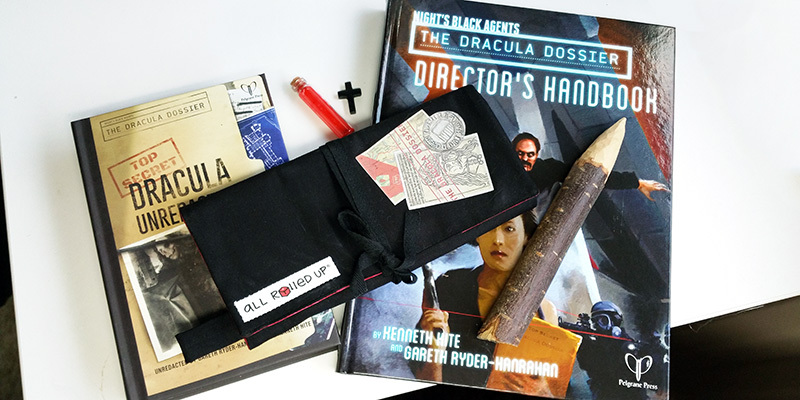 And most important for all would-be vampire hunters loading up their The Black Archive All Rolled Up accessory for the first time – you’ll find the pocket on the far side of the pen and pencil tidy has more than enough room to hold your favourite, seasoned wooden stake. As nominated products in 2016 ENnie Awards, you can vote for both All Rolled Up – Dracula Dossier: The Black Archive (Best Play Aid/Accessory) and Dracula Dossier – Director’s Handbook (Best Adventure, Best Writing and Product of the Year).